UPND continues losing support over misguided adoption of Charmaine Musonda for Chilanga by-election. Even people in PF are shocked by this level of political misjudgment. Surely the UPND must view this backlash from the public as an expression of goodwill and not a challenge. People are tired and disgusted by PF and are looking for alternative. But then people are not looking for just any alternative; they are looking for quality, trustworthy leadership with integrity. In fact, people don’t hate Charmaine Musonda per se. They are only saying given the recent events in her life and her close connection with the jailed MP, she is not the most suitable person to adopt. People are asking the UPND to give them a credible candidate free from damaging drama. The UPND leaders must ask themselves why people are so interested in their candidate but not concerned about the PF candidate. It shows where public sympathy lies. It’s not to late for HH, GBM, Mrs Nalumango and the two secretary generals to show leadership by listening to the people. Preserve Charmaine for future contests; right now she needs to rest and reflect on her life. People have their own perceptions about Charmaine Musonda ‘s role in the murder case. It’s just to early to toss her on the political scene. Whatever happened during to 2016 elections where we hear she won primary elections is right now irrelevant. That was before she was arrested for murder. The UPND must respond to the people’s reaction and explain their decision to adopt Charmaine Musonda for the Chilanga seat, if at all there is any validation. She cannot be disassociated from the murder crime Mukata committed whether she is guilty or innocent. In politics the court’s opinion does not matter, it’s the court of public opinion that counts. This is the unjust reality she has to face for being in the wrong place at the wrong time. With this choice UPND are not offering voters a capable candidate, they are offering voters a murder suspect with a mystery which only herself and Mukata knows. I don’t want to call her a prostitute or a criminal but this is definitely insensitive to the family of the diseased guard. For God’s sake, UPND should be better than PF, who appoint ministers with a record of shooting people. The best UPND should do is demonstrate leadership and humility by acknowledging their misjudgement and field another candidate. 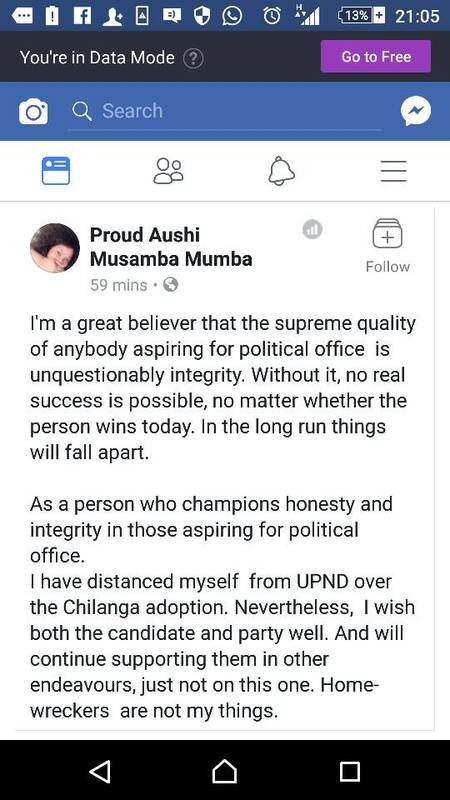 Charmaine Musonda must also read the mood and accept that it is too soon and grossly awkward to replace Mukata. This has a bad taste, because to some extent justice won’t be fully served to Mukata if UPND are suggesting that even in prison Mukata will somehow managed to keep his job through a “surrogate”.